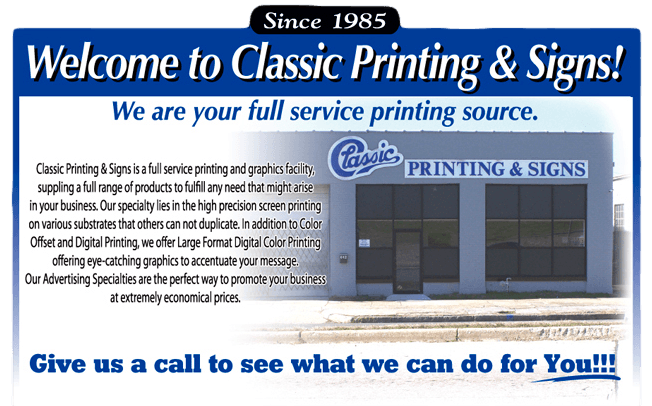 Classic Printing and Signs Birmingham AL – Substrate Materials – Classic Printing and Signs specializes in large digital format printing, vehicle wraps of all sizes, signs, banners and speciality items. Need Help with Your Next Sign Project or Advertising Specialties Campaign? License plate inserts, also known as drive out tags, are a great resource for advertising to strengthen your dealership’s brand. We offer a wide variety of inserts, including different styles and materials, to meet the needs of any auto dealer. Classic Printing and Signs helps businesses in benefit from mobile advertising by customizing their commercial vehicles using the vehicle wraps to change them into mobile billboards. Communicate with your audience on a grand scale with custom signs and custom banners from Classic Printing and Signs. If your current indoor or outdoor signage isn’t giving you the visibility to increase sales or to attract interest and assist in getting people to your door, then it’s time for a specialized sign solution from Classic Printing and Signs! Whether you require a business sign, school sign, decals or custom banner, we have a wide variety of products as well as the capability to create the ideal sign to fit any need. Need More Exposure in Your Business? Ask about our Ad Specialty Products. Classic Printing and Signs is Your Advertising Solutions Resource.